YS Flooring installs everything from broad loom carpets to carpet tiles. Our Project Managers help customers make the right selection based on design specifications, application and budget. YS Flooring professionals deliver high quality workmanship and follow all project specifications. We’re only satisfied when the customer is satisfied. Installing carpet requires a complex knowledge of people skills, technical ability, craftsmanship. 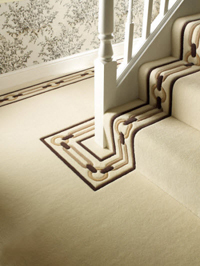 The traditional and most frequently used style of carpet installation is "Over Padding". Before the carpet or rug is put down, padding should always be laid first. Padding gives more cushioning for your feet and keeps the rug from sliding, which helps prevent slips, falls and spills. For wall-to-wall carpeting installation, the most common method is to lay wooden tack strips around the perimeter of the room. The tack strips have pins sticking up that grab the carpet and hold it in place. The tack strips are attached to the floor using small nails, which leave holes in the floor when the carpet is removed. The padding also is usually either nailed or stapled to the floor. No padding is used in "Direct Glue Down" installation. Adhesive is spread on the floor, the carpet is laid down and all seams are made. The adhesive creates a permanent bond between the carpet and floor. This type of installation is most commonly used with commercial type carpets. In residential applications it would be used in kitchens, basements and in outdoor situations like patios. Carpet can be seamed and trimmed to fit wall to wall without being attached to the floor in a "Loose Lay" Installation. Binding can be applied (usually this will be an in store service and the carpet can then be delivered to you upon completion) for a nice finished edge. This type of installation is ideal in apartments were landlords will not allow installation of new carpeting, tile and wood floors that you don't want to damage with installation procedures, or situations were you will want to take your carpeting with you when you move. Carpet tiles are square sections of carpeting that are sometimes used in place of rolled carpeting. Available in a variety of designs and styles, these simple carpet squares make the process of installing carpeting in a room much less messy and complicated. Along with easy installation, carpet tiles also can be replaced easily in the event that a section of tiles are stained or worn over time, without having to replace the entire carpet. Carpet tile sections are uniformly constructed as squares that are eighteen by eighteen inches. 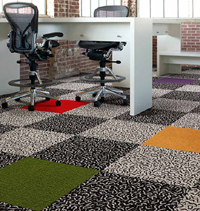 The carpet tiles on the market today are offered with both adhesive and non adhesive backs. Versions that feature adhesive backs are installed by peeling off the protective sheeting on the backing, and affixing the carpet tiles in position on the flooring. 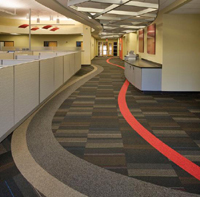 Non-adhesive models can be placed in position with the use of double sided carpet tape. When it comes to styles, it is possible to obtain carpet tiles in just about as many different designs and weaves as any form of rolled carpeting. One important difference is that the pile for carpet tiles tends to be shorter than some other forms of carpeting. However, there are still several different grades of thickness that can be purchased, so carpet tiles will work well in most instances. One great advantage of carpet tiles is that it is a relatively easy job to replace a tile when some type of damage takes place. For example, if a square is stained, it is a simple task to replace the damaged tile with another tile of the same design. Should a section of tiles become worn from traffic, there is always the option of exchanging the worn tiles with other tiles in the overall design that are currently located under furniture or sections of the floor that see very little wear. Many persons who choose to install carpet tile flooring often purchase additional tiles to keep on hand for easy replacement. This can be a great idea if the plan is to keep the carpet tiles in use for a number of years. As with many textile products, the designs and colors for the carpet tiles will vary somewhat from year to year, so exact matches may be somewhat difficult to achieve after the tiles have been in place for an extended period of time.